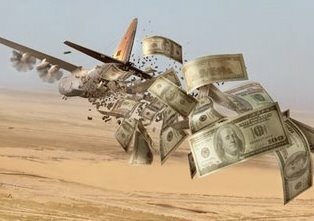 “As long as the $1.2-trillion annual budget for the military-security complex is off limits (to cutting), nothing can be done about the US budget deficit except to renege on obligations to the elderly, confiscate private assets or print enough money to inflate away all debts,” Paul Craig Roberts, former Assistant Treasury Secretary under President Reagan warns. In an article titled “Stealing from Social Security to Pay for Wars and Bailouts,” published in the April issue of the “Rock Creek Free Press” of Washington, D.C., Roberts says that Republicans are calling Social Security and Medicare “entitlements”---making them sound like welfare---when, in fact, workers over their lifetimes have contributed 15 percent of all their earnings to the payroll tax that funds these benefits and have every right to them. And far from Social Security being in the red, between 1984 and 2009, Roberts writes, “the American people contributed $2-trillion...more to Social Security and Medicare in payroll taxes than was paid out in benefits” but “the government stole” that sum to fund wars and pork-barrel projects! What's more, under one realistic estimate, far from crashing into the red, “Social Security(OASDI) will have produced surplus revenues of $31.6-trillion by 2085, Roberts says. Americans, apparently, are unaware of how the federal government's illegal, foreign wars sap the economy and rob every household. The Iraq war cost alone is 20 percent of the size of last year's entire U.S. economy. Instead of investing that sum at home, “which would have produced income and jobs growth and solvency for state and local governments, the US government wasted the equivalent of 20% of the economy in 2010 in blowing up infrastructure and people in foreign lands,” Roberts says. “The US government spent a huge sum of money committing war crimes, while millions of Americans were thrown out of their jobs and foreclosed out of their homes,” he added. Viewed another way, the Pentagon continues to expand and put people to work to modernize its 700-800 bases abroad in order to dominate every corner of the globe while public works and public employment in America are going into the toilet. I truly believe in freedom of expression but any racist or derogatory statements directed at our fellow Americans will not be tolerated. hmm interesting post man, I am not american but this was an interesting read, since I believe alot of information is kept from Americans the only thing I dislike about America is the damn news channels, damn they piss me off lol.